Going head-to-head with your best friend is never easy, on the court or off. Josie loves hottie Ethan Lancaster, the captain of the basketball team, but she never can do or say the right thing in front of him. So how can it be fair that Ethan is only interested in her best friend, Cami, when Cami isn’t even trying for his affection? Or is she? 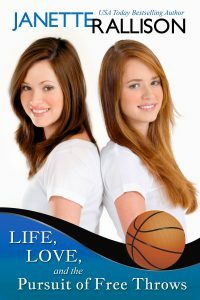 Cami dreams of winning her basketball team’s coveted MVP award, and earning the chance to take the court during a special halftime demonstration with WNBA star Rebecca Lobo, but her best friend, Josie, is a better player. So how can it be fair that Josie is a shoo-in for the honor if she is barely interested in basketball in the first place and isn’t even trying to be the best? Or is she? Told from two points of view, this novel of freshman life, love, and the pursuit of free throws displays the same delightful humor as Playing the Field and All’s Fair in Love, War, and High School. As sports become a more integral part of girls’ lives, it’s important to see this experience reflected in teen fiction. Following on the heels of the success of All’s Fair in Love, War, and High School, and accompanied by the paperback release of Playing the Field, Janette Rallison hits the mark again with a third wry, witty, romantic comedy. The climax of the story features a cameo appearance by real-life WNBA superstar Rebecca Lobo.